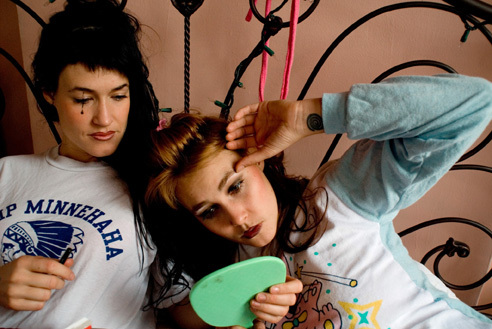 Artists You Should Know: CocoRosie + Free Mp3 Download | True Endeavors Presents: music, tours, tickets, mp3 downloads, concert pictures, videos, Madison WI. The fruits of their labor, La Maison de Mon Reve, was released in spring 2004 by Touch and Go and was predated by a string of dates in New York with Devendra Banhart, the Gena Rowlands Band, Battles, and Ratatat. Their second album, Noah’s Ark, which featured cameos by Devendra Banhart and Antony of Antony and the Johnsons, arrived in fall 2005. 2007’s The Adventures of Ghosthorse and Stillborn was a more polished but still eclectic effort. The following year they released the single God Has a Voice, She Speaks Through Me, which also appeared on 2010’s Grey Oceans. Inspired by the sisters’ travels through Europe, Australia and South America, the album was released by Sub Pop. Grey Oceans isn’t short on tracks both catchy and cerebral: “The Moon Asked The Crow” combines baroque piano noodling with a thumping, body-moving hip-hop beat, while “Lemonade” mashes together eerie, dreary techno balladry with a softly orchestral chorus. The sisters are to pop what Carter was to literature, too, spinning nightmare fairy-tales in voices ethereal (Sierra) and beautiful-grotesque (Bianca), to a fantastical blend of hip-hop, nursery lullabies, opera and shaman ritual song. Based between Paris and Williamsburg, New York, sisters Bianca “Coco” and Sierra “Rosie” Casady have pursued a studied sort of oddity that has entranced some just as it has bemused others – a hodgepodge of folk, blues and cabaret unafraid to mess with racial or gender roles, or toy with pastiche in its pursuit of hallucinogenic, cracked-mirror creativity. To my ears, Lemonade was the immediate standout track on the new album. Cannot wait to see these two live. Expecting a BEAUTIFULLY STRANGE show.